For more than a decade, there has been growing interest in the role of emotions in academic settings. 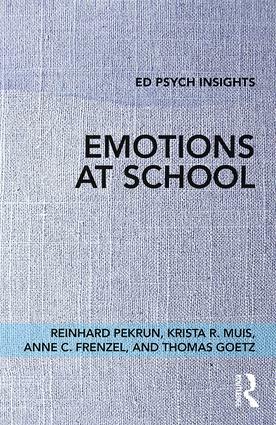 Written by leading experts on learning and instruction, Emotions at School focuses on the connections between educational research and emotion science, bringing the subject to a wider audience. With chapters on how emotions develop and work, evidence-based recommendations about how to foster adaptive emotions, and clear explanations of key concepts and ideas, this concise volume is designed for any education course that includes emotions in the curriculum. It will be indispensable for student researchers and both pre- and in-service teachers alike. "Emotions at School provides a comprehensive yet accessible examination of the role of emotions in learning. This is a valuable resource for psychologists and educational researchers who study student learning and motivation and a must-read for students, educators, or researchers who want to learn how to foster productive emotions that support learning." Reinhard Pekrun is Professor and Research Chair for Personality and Educational Psychology at the University of Munich, Germany, and is Professorial Fellow at the Institute for Positive Psychology and Education at Australian Catholic University, Sydney, Australia. Krista R. Muis is Associate Professor and Canada Research Chair in the Department of Educational and Counselling Psychology at McGill University, Canada. Anne C. Frenzel is Professor of Educational Psychology and Academic Director of the M.Sc. Program Psychology: Learning Sciences at the University of Munich, Germany. Thomas Goetz is Professor of Educational Sciences and Chair for Empirical Educational Research at the University of Konstanz, Germany, and is Professor at the Thurgau University of Teacher Education, Switzerland.